RALEIGH, N.C. (AP) — Hurricane Florence churned Tuesday toward the Eastern Seaboard as a storm of “staggering” size, forcing a million people to evacuate the coast. Many more were left to wonder where they might be safe if days of torrential rains unleash floods from the mountains to the sea. “This one really scares me,” National Hurricane Center Director Ken Graham warned. Florence is so wide that a life-threatening storm surge was being pushed 300 miles ahead of its eye, swirling clouds that could deluge states from South Carolina to Ohio and Pennsylvania as it slows and then stalls over land. “You’re going to get heavy rain, catastrophic life-threatening storm surge, and also the winds,” Graham said. There was little change in Florence’s track during the 11 a.m. forecast from the National Hurricane Center. Sustained winds were 130 mph (215 kph) Tuesday morning, but it remains a Category 4 storm and is expected to intensify to near Category 5 status as it slows over very warm coastal waters. The storm is currently around 400 miles south of Bermuda and is moving at 16 mph (26 kph). The eye of the massive storm is forecast to make landfall late Thursday or early Friday along a stretch of coastline already saturated by rising seas, and then meander for days. Seven-day rainfall totals are forecast to reach 10 to 20 inches over much of North Carolina and Virginia, and even 30 inches in some places. Combined with high tides, the storm surge could swell as high as 12 feet. States of emergency were declared by Washington, D.C., Mayor Muriel Bowser for the nation’s capital; requested by Virginia’s governor; and approved by President Donald Trump for North and South Carolina. The very center of that bull’s-eye may be Camp Lejeune, the sprawling Marine Corps training base, where authorities were opening emergency operation centers, staging equipment and urging families on the base to build survival kits with food and equipment needed to sustain themselves for 72 hours. Florence could hit the Carolinas harder than any hurricane since Hazel packed 130 mph (209 kph) winds in 1954. That Category 4storm destroyed 15,000 buildings and killed 19 people in North Carolina. In the six decades since then, many thousands of people have moved to the coast. Ahead of Florence’s arrival, barrier islands were already seeing dangerous rip currents and seawater flowed over a state highway — the harbinger of a storm surge that could wipe out dunes and submerge entire communities. Watches in effect Tuesday forecast a storm surge of up to 12 feet at high tide from Cape Fear to Cape Lookout in North Carolina. 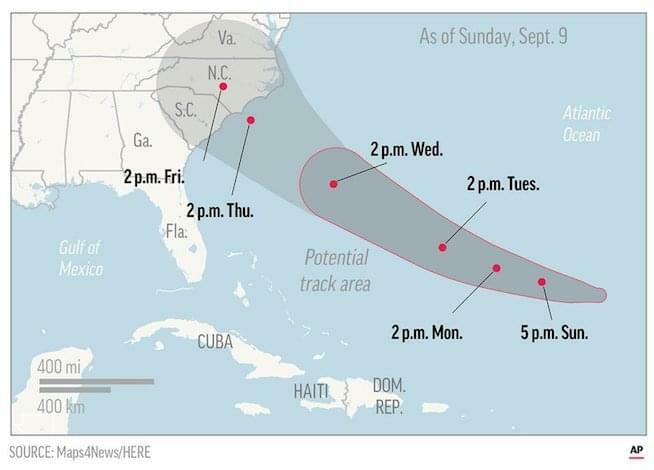 A hurricane watch was in effect for Edisto Beach, South Carolina, to Virginia’s southern border, with the first hurricane-force winds arriving late Thursday. Florence’s projected path includes half a dozen nuclear power plants, pits holding coal-ash and other industrial waste, and numerous hog farms that store animal waste in massive open-air lagoons. Duke Energy spokesman Ryan Mosier said operators would begin shutting down nuclear plants at least two hours before hurricane-force winds arrive. A warm ocean gives hurricanes their fuel, and Florence is moving over an area with water temperatures nearing 85 degrees (30 Celsius), hurricane specialist Eric Blake wrote. With little wind shear to pull the storm apart, hurricane-strength winds have been expanding to 40 miles (64 kilometers) from the eye of the storm, and tropical-storm-force winds 150 miles from the center. Information gathered Tuesday by a hurricane-hunting aircraft suggests it will intensify again as it nears the coast, approaching the 157 mph (253 kph) threshold for a worst-case Category 5 scenario. In the Pacific, Olivia became a tropical storm again, on a path to hit the Hawaiian islands early Wednesday. Liz Browning Fox was planning to ride out the storm on the Outer Banks, defying evacuation orders. She said it was built in 2009 in Buxton, North Carolina, up on a ridge, and made to withstand a hurricane. But even the most secure homes could be surrounded by water, or penetrated by wind-launched debris. “You never know, there could be tree missiles coming from any direction,” she said. “There is no way to be completely safe,” but going inland might not be much safer. “I don’t know where to go from here,” she said. Associated Press writers Seth Borenstein in Washington; Jennifer Kay in Miami; Jeffrey Collins and Meg Kinnard in Columbia, South Carolina, Jeff Martin in Atlanta and Tamara Lush in St. Petersburg, Florida, contributed to this report.